This boat is owned by Arnold & Joe, who are returning to M17s after five or six years. We owned Little Breeze, an M17 which we sold to upgrade to a Yankee Dolphin 24. That was an excellent boat, but turned out to be too big for our purposes. June of 2017 we sold her and returned to Montgomerys. With two small children, trips will mostly be daysailing the river, but as they get a little older we hope to trailer her up to the San Juans or over to Astoria. We're moored in the Columbia River in Portland, Oregon. 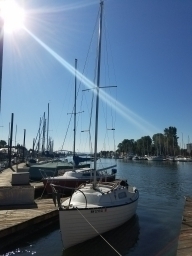 Projects on the boat are either modifications to suit our sailing style or to prepare the boat for being moored seasonally in the Pacific Northwest. This fall (2017), we renamed the boat from "Course Correction" to "Skookum". Skookum was a word my grandfather was very fond of and seemed appropriate to us, the M17 being such a strong, stout boat for its size.